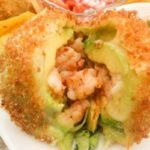 Stuffed Mushrooms Recipe | Mexican Appetizers and More! 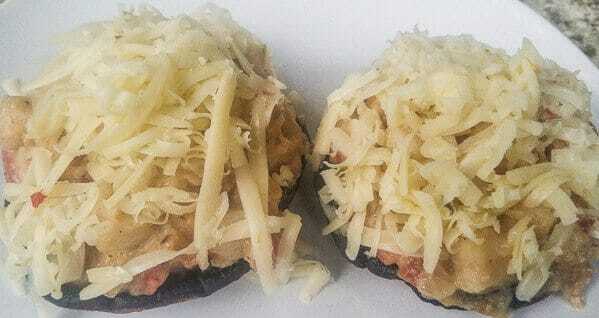 The best Stuffed Mushrooms Recipe! Made with scallops, onions, tomato, jalapeños, heavy cream, butter, pepper jack cheese and fresh bread crumbs. Moist, creamy and hyper delicious! So my fellow readers and Mexican Appetizer foodie lovers, in a previous post, I mentioned that I will start integrating music into my posts. The purpose of this is ten-fold…..I want to inspire you, I want to bring emotion in your day, in a moment you may be living, in the people that are surrounding you, or the ones you wish were, music can bring us to a great emotion, whether, happy, sad, powerful sense of self, inspirational, or remind us of aspirations, or a memory, or a sensual feeling, a bond we felt with someone, or simply enjoy a song, it’s tone, melody, words…. So I have decided to share some of MY MOMENTS with you, so as you are making a particular recipe, I want you to listen to the song and get INVOLVED in YOUR RECIPE, I have always felt that food ALWAYS tastes better when done and created with love, emotion and heart and when the right song is playing, the magic happens!!! So today’s song for “Stuffed Mushrooms Recipe” is Santana’s, “Moonflower.” I chose this song for this recipe because, it’s one of my favorites and it was playing on my shuffle while I was making this recipe…..I think it’s perfect!! A Stuffed Mushrooms recipe is my dream…alll the time!! I don’t know what it is about stuffed mushrooms but they’re just about in my every dream! LOL Okay, Okay maybe a little bit of an exaggeration but really Stuffed Mushrooms can become a seventh heaven, a sort of rhapsody for me. 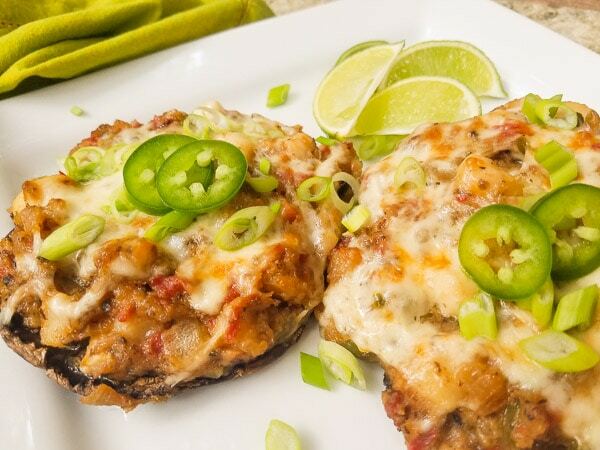 Especially this stuffed mushrooms recipe because one they are portobello mushrooms and two because they are stuffed with scallops! First of all any scallops recipe is delicious in my book and you guys know me, I’m all about Seafood! And scallops are just perfect for these stuffed mushrooms. 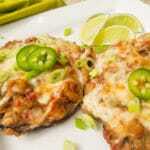 Usually any stuffed mushrooms recipe out on the internet today is enticing, tasty and yummy. Whether you decide to try a recipe of stuffed mushrooms with cream cheese, stuffed mushrooms with crab meat or your very popular stuffed mushrooms with Italian sausage. But one thing I do come across every so often, is either dry or bland stuffed mushrooms. Well my friends, you will not have that problem with this Stuffed Mushrooms recipe. 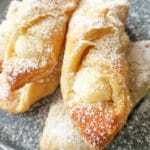 They are not only incredibly delicious, heavenly with flavor but also delectably moist! These are just perfect! The great thing is these babies are so easy, hence easy stuffed mushrooms to make and yet hyper-delicious and truly satisfying with taste. So if you’ve got 30 minutes to spare and want something super yummy for tonight’s mexican appetizer, I promise you this is the way to go. 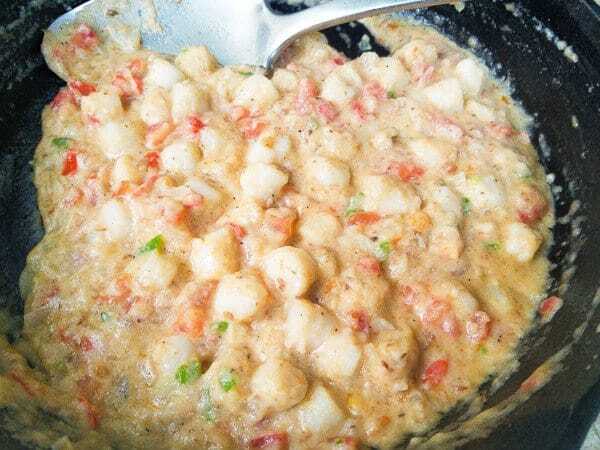 So hop in your car and go buy some scallops, the rest of the ingredients you probably already have in your pantry and fridge, heck you probably already have the scallops too if you are as fanatical about seafood as I am!! 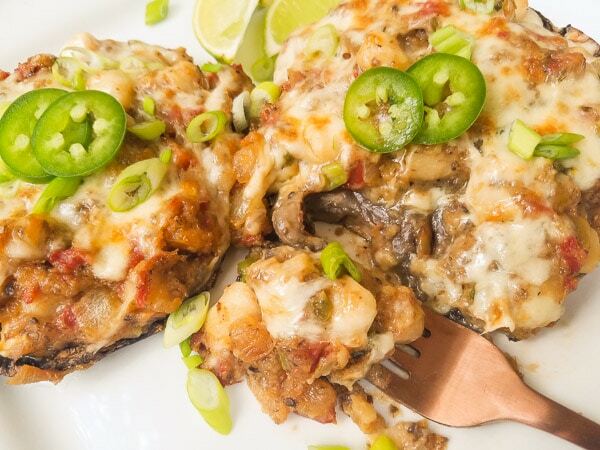 What we need for these easy stuffed mushrooms recipe…portobello mushrooms of course, scallops (of course 🙂 ), onion, tomato, jalapeño, garlic, fresh bread crumbs, pepper jack cheese, heavy cream (secret ingredient 🙂 ) and butter. 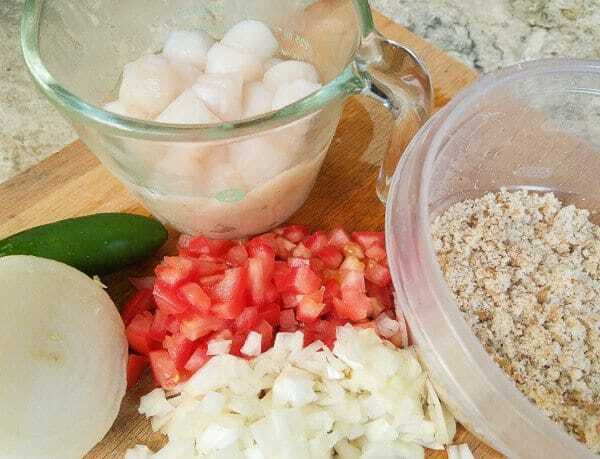 If you are not a fan of scallops, replicate all steps in my recipe with crab meat, I won’t mind! 😉 But hopefully you do enjoy scallops and will make this stuffed mushrooms recipe! 1 cup bay scallops rinsed.... 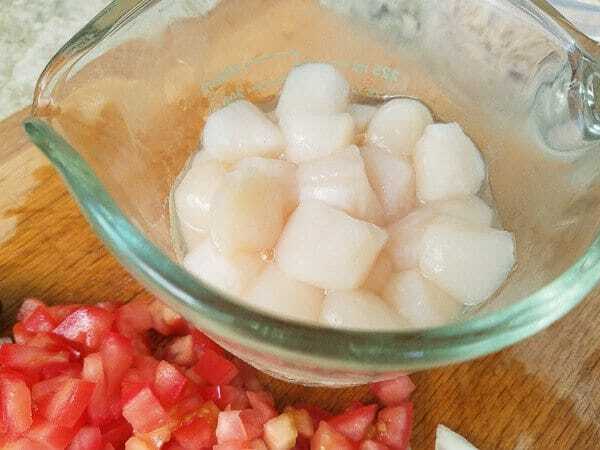 If scallops are frozen, defrost in refrigerator with a little bit of cold water for 20 minutes and then rinse. Brush any dirt off of mushrooms. 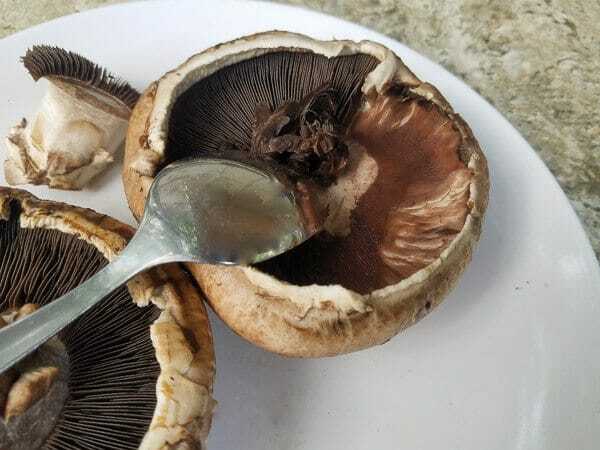 Remove stems and scrape off gills with a spoon. Place on a baking tray and drizzle olive oil over both mushroom caps. Season both sides with salt and pepper. Bake for about 12 minutes. 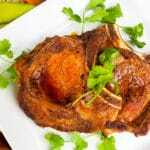 Remove mushrooms from oven and set aside. Break up sliced bread with your fingers and place in a chopper or blender to make fresh breadcrumbs. In a pan over medium heat, add the butter. Add the onion, jalapeño and cook until onion is translucent. Add garlic and scallops. Cook for 5 minutes and then add the chopped tomatoes. Cook for another 2 minutes. Add breadcrumbs and heavy cream. Stir well together and season with salt and pepper. Spoon scallop mixture onto mushroom caps. Top them with shredded pepper jack cheese. Bake or broil for a few minutes until cheese is golden brown. Serve immediately with lemon wedges. Note: Garnish with a sliver of jalapeño and scallions. Enjoy! 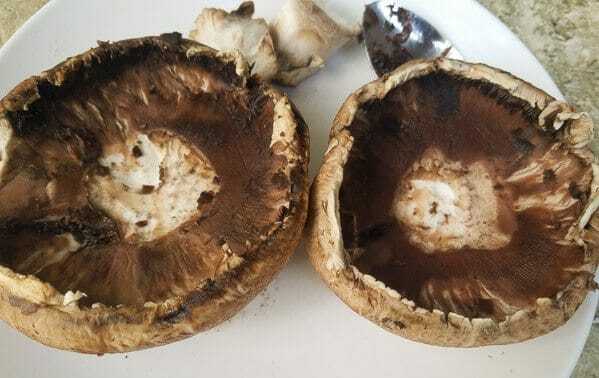 Remove stems and then gills from portobello mushrooms with a spoon. 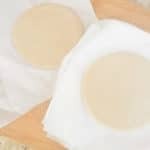 If you don’t remove gills, they will turn your mixture black and an ugly color once they are baked. 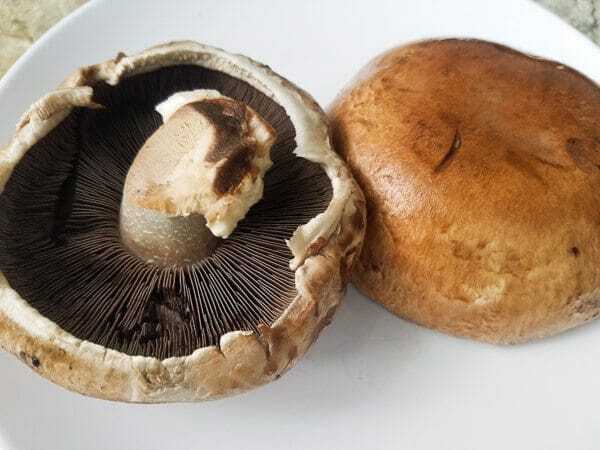 Portobello mushrooms after stems and gills have been removed. 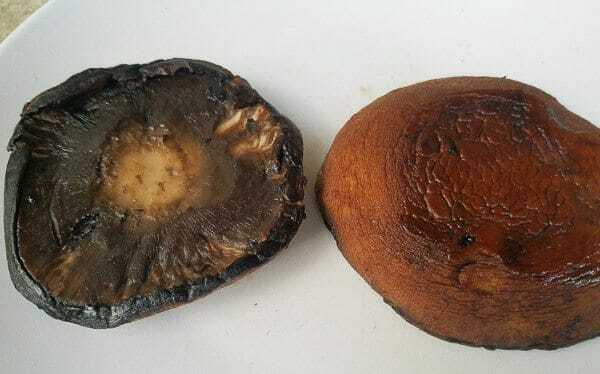 This is what your portobello mushrooms should look like after they have been baked. Now they are ready to stuff. 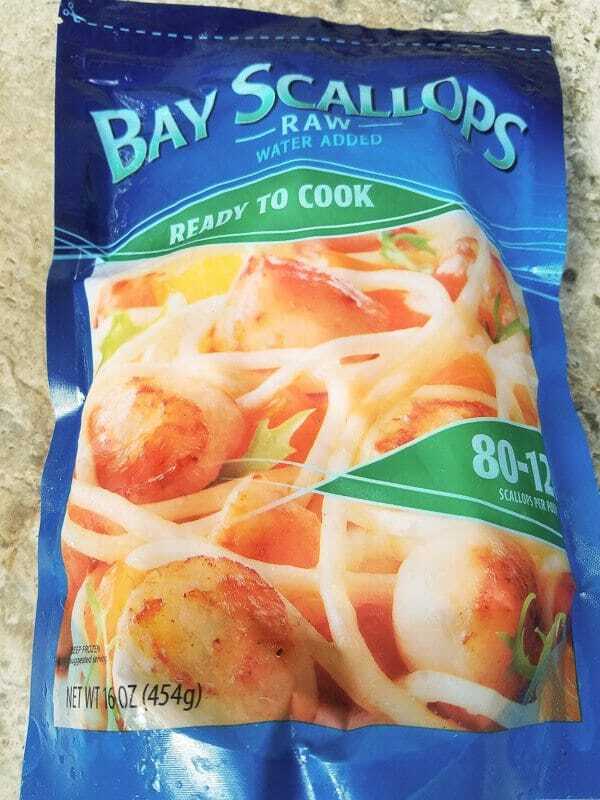 You can use fresh scallops or frozen, I used frozen bay scallops bought at my local Walmart. Most of the ingredients used in this recipe. Delicious yummy scallop mixture now ready to stuff the portobello mushrooms. After stuffing mushrooms, top with pepper jack cheese. Now they are ready to bake. 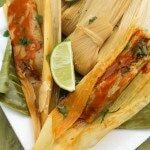 All done….ready to devour!! YUM!! Please leave me your comments and let me know what you think!